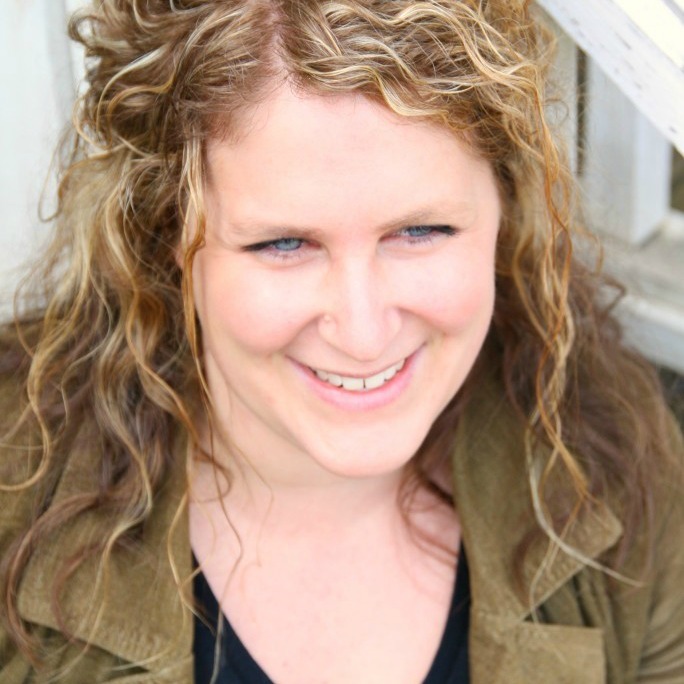 I showed you how to make chicken bone broth work into busy, “real mama schedules” in THIS post. Now let’s talk beef bone broth. Why? Both broths have the same nourishing attributes, but sometimes you need a richer, beefier flavor than chicken broth for certain meals like stew or french onion soup! Also, beef bones (sometimes labeled as soup bones at your butcher) are super cheap. 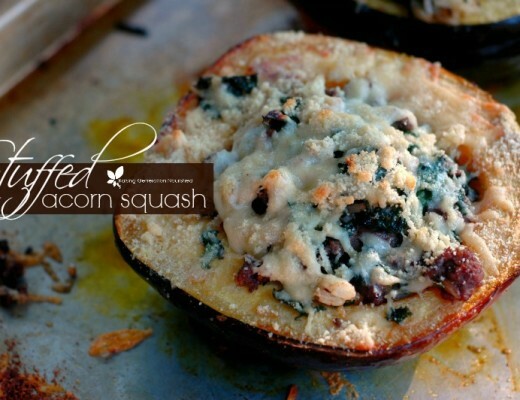 This is such an affordable way to get vital minerals, nutrients, and protein into your family. I can’t afford more than about 1 whole chicken per week or so, and I use the bones up as good as I can for making chicken bone broth. But I can buy soup bones at a very good price – the farm we get them from sells 3lb bags of just the bones. If you are a family that likes to purchase a side of beef (whether ¼, ½, or whole cow) every year, you certainly have a good supply of bones to use as well. Use them up! I can get 3-4 gallons of beef bone broth out of one 3lb bag of beef bones! If you are unsure of where to purchase bones from, ask around at your local farmer’s markets. Check out THIS site for farmers in your area that provide raw milk – many of them also sell beef products from what I have found. Find a local WAPF chapter near you and ask the leader – they will be *more* than happy to point you in the right direction! Sometimes you need a richer, beefier flavor than chicken broth for certain meals like stew or french onion soup! Try your hand at beef bone broth. Roast the raw bones in a 400 degree oven for an hour. Put the roasted bones, veggies, and ACV into your crockpot or oven roaster and fill with water to cover the bones by an inch-ish. Turn the crockpot on low or oven roaster at 200-225 degrees for 24-36 hours. I roast my bones on a large jelly roll pan – I get quite a bit of fat (tallow) run off and this is fantastic for frying/sautéing in! I use my roasting oven and do 2 “rounds” of bone broth with these huge beef bones. I get 8 quarts (about 2 gallons!) of bone broth from one batch and then put them back in for another round and get another 4ish quarts. Doing it this way I usually only need to make beef bone broth every other month! Beef bone broth does have a richer flavor than chicken stock – I don’t usually drink it straight out of the mug – although you can! 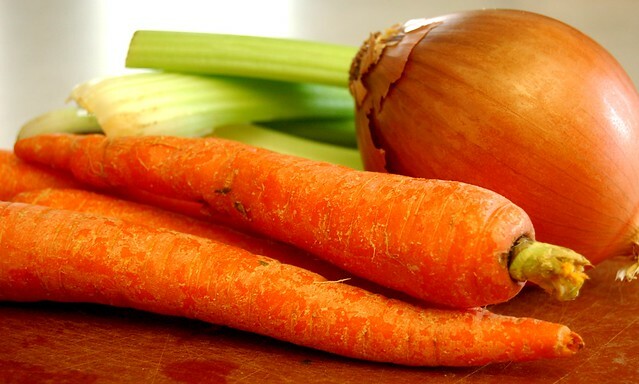 I prefer using beef bone broth for soups like French Onion or Beef Stew. I don’t season my broth while making it that way I can season it to whatever recipe I am using. All 3 of my girls will drink beef bone broth straight out of a cup (well my 5 month old off a spoon or syringe for now!)! Don’t forget those babies! 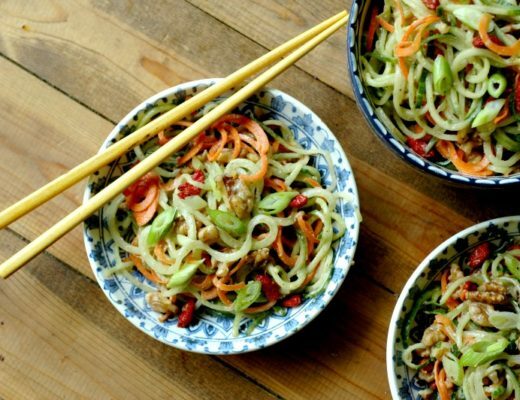 Creating a healthy taste palate for menu items like this is so nourishing and is so beneficial to your meal making plans! Let me know how the bone broth making goes – and what you use it for! Used my oven roaster to make your broth recipe. Awesome! Plenty to freeze. Tastes wonderful! Thank you!!! 1) Can I keep meat on the chicken bones while making broth, then pull the meat off the bones for chicken soup? If so, how long can I simmer the whole chicken before removing the meat pieces to use in chicken soup? 2) When making Beef Bone Broth… do I have to remove the marrow? Can I leave it in? Hi Michele! I’m so glad you enjoyed the broth! Sounds like you did great! 1) I don’t tend to cook the meat for chicken as long as bone broth takes. What I typically do is cook the chicken – say 8 hours on low in the crockpot, and then strain off the liquid from that – it is called “meat stock” – a little different than bone broth but it is just as useful for making soups and gravies or cooking rice in and still nourishing. And then I make the bone broth after I take the meat off. Does that make sense? You just don’t want to cook the meat for 24 hours. Do you think you could you do this in a heavy pot/roaster in the oven? Hi Sally! I have never tried that before – traditionally bone broths were simmered on stovetop so I don’t see why you couldn’t do it in the oven as well! Can I use lamb bones instead of beef? Hi Nir! Yes absolutely! Great question! I want to use a pressure cooker but don’t know what setting to use and how long to cook to avoid destroying the gelatin? Do all bones make gelatin or just the ones with connective tissue? Hi Wyatt! I have never used a pressure cooker, and am unsure of the settings – I do know I have heard of some using them though and they work. Get all of the bones in there! The gelatin pulls from all of them! I must be using too high of a temperature at times because I don’t get the gelatin. I usually throw the ones away after one go but from what you say you can sue them over and still get gelatin and good broth? The recipes you have make me want to cook some and I usually don’t like to spend a lot of time but I am off to the store soon to get some stuff and make some broth! Hi Just tried making the beef bone broth but mine does not look clear like the pic on the site – it is thicker and looks fatty – did I do something wrong – there wasn’t really any fat to scoop off of the top when it was cooking – thanks! Hi Jamie! You might have not had as much water as mine possibly. Also, the fat rises to the top after it cools in the fridge – how is it looking this evening since it has cooled? I found your recipe after attempting it on my own Ugh!! I did not roast the beef bones before putting in the pot. Omg did I totally mess it up? I hope not . I’m a hashi’s thyroiditis girl . Hi Rose 🙂 No you didn’t ruin them – the flavor of the broth will be richer and beefier with the bones roasted first, but you will still have the nutrients in yours. Hi Renee, I have access to deer bones, however, they are not going to be previously cooked because we take the deer to the processor and get the ground venison and roast. Since they are raw bones do I need to do anything to them before I put them in the crock pot? Thanks for your help!! Hi Casy! Yes I would roast the bones just like the bones in this beef bone broth recipe and you should be good! Great question! I tried making this and it looked to be a very rich broth, very deep in color, etc. When I tasted it however it was super bland. I was hoping to make into French onion soup. I have more bones to try this again. Any suggestions for me? Thanks! Hi Alica! That’s great – the color alone says you did everything right – it just needs to be seasoned. I don’t season my broth while it is simmering because I as I use the broth for different recipes I want to season it for that meal – definitely go ahead and use your broth for French Onion soup – it will taste really great – I have a recipe for it if you need one to follow 🙂 I hope that helps! Thank you so much for your fast response. I am feeling much better now! I started a new batch in my roaster pan (roasted bones in the oven first) This time around, I added fresh parsley, and small amounts of salt, pepper. 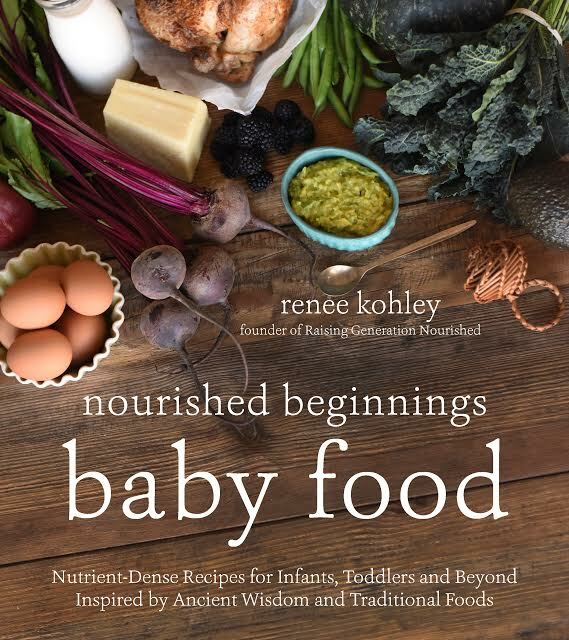 Love the idea of all these nutrients and I did it all myself. Can’t wait to make my onion soup. I would love your recipe! Thanks again!! Hi! I am so excited to get started making my own bone broth. I would love to use my roaster oven but I am worried about the lid. It has two tiny slits on top, which I’m assuming would let out steam and may cause the liquid to evaporate. Am I just being too worried or is that a legitimate concern? Hi Jenna! Yep! Mine does too! It is fine – yes some will evaporate but not much – I fill the water above the bones by about an inch. Hope that helps! Great stuff here, Renee. I’m a bone broth fanatic. I have a 16-quart stainless steel stock pot and I cook it for 4-5-6 days. Then I strain and refrigerate in bowls for a day or two to let the fat solidify on top. The last batch got an inch of solid fat which I easily picked off and threw out. I never see a bone broth recipe that calls for this step. Do you not do it? I could put the strained soup in my glass freezer containers and freeze it with all that fat but isn’t that just “not done”? I’ve been making my own broth for many years and never don’t do that! Hi Marge! Thank you for your kind words! That is so great that you have been making your own bone broth! I save the fat! I probably ought put that in the post! It is great for cooking in. Beef fat (tallow) is fantastic to fry in! Save your next layer and the next time you want to make a great breakfast try chopping up a some potato and fry it in the tallow for hashbrowns 🙂 It will change your life! (Not really – but it is really good!). Tallow is extremely nourishing and has many health benefits to consumption! That’s so interesting. I just today dealt with my very chilled (in fridge for two days) 5 large bowls of strained bone broth. Some bowls had thicker layers of fat (tallow?) than others. I threw it out. I read in another blog that tallow is the fat near an animal’s kidney so that this thick layer is fat and not tallow. I’m happy using coconut or avocado oil when sauteing or roasting, so I’ll continue to discard it. I use a 16-quart stock pot and today I added 35 cups of dark bone broth to my freezer in 14 glass containers. I use it when reheating food mostly because I like reheating liquidy stuff and when sauteing or making soup. I adore it! THANK YOU FOR YOUR REPLY AND YOUR BLOG! Thanks for your good work, Renee. Renee, I’m happy to find this post & discussion. (And here I’ve been tossing my tallow! I’ve already learned something important.) I just made my first batch of bone broth after being inspired by 2 visits to Brodo (hip East Village walk-up bone broth window) when we were in NYC over Christmas. I used about 2-3 lbs. of beef bones (roasted first) which I simmered for 24 hours before adding the bones of a chicken we’d cooked and stripped. Simmered that for another 24 hours (adding the basic array of veggies for the last 8). Here’s my discoveries and my dilemma that I’d love your thoughts on: I used a total of about 6-7 quarts of water (as I’d keep adding as needed to keep the bones covered) but once I strained it we were left with barely more than 2 quarts of actual broth! Does that sound right? That is a LOT of work, and electricity** spent, for a modest serving for each of us for just a few days — not even a week’s supply. [** I live in the mountains where there’s no natural gas, so I have an electric ceramic cooktop.] I used the largest pot I currently have, which is a Le Crueset oval that I came close to maxing out w/ the ingredient amounts I just mentioned. If I had a gas stove I’d maybe get a big (5-gal.) stainless pot, but my guy thinks the electricity we’re using for 2+ days of cooking is not inconsequential. Crock pots don’t come big enough (and there’s also the concern of lead in some)… so now I’m looking into a 22-qt. roaster-oven, which one can evidently cook soups in as well as turkeys. I’d love all that simmering and skimming and tending to yield enough to eat some, freeze some and not have to rinse & repeat immediately, lol. I’d love your advice, Renee, or anyone else out there who has navigated these dilemmas. Thanks so much, and let’s all just broth on!! Hi Marcy! So glad your broth turned out so well! With regards to the “beefy” smell 🙂 Yep – it’s beefy…and makes the house smell beefy. It only bothers me when I am pregnant -ha! And I usually do it in the garage when I am pregnant so I don’t have to smell it! That and your tip to keep your door closed is all I got there! Whatever you are simmering your bones in just cover with water by a couple of inches – there will always be some evaporation when cooking for a 24 hour period like this. So fill that large pot as much as you can. I use the big roaster oven a lot of the time so it is “roomier” – I think you will like it. I hope that helps – let me know if I can answer anymore questions! I actually made a discovery not long ago that I’ll pass along in case it’s of interest to you or any of your readers, having to do with cooking odors. It’s been a Godsend to me, since ANY odors in the air will keep me from sleeping and/or actually wake me up. It’s call Lampe Berger, and it’s a (flameless) catalytic burner system invented by a French pharmacist to purify the air in hospitals. You can get a gazillion different scents for it, which is a highly personal thing to choose. (My current favorite is Wintertime in Russia.) I use a ratio of about 3- or 4-parts neutral (no fragrance) oil to 1 part of fragrance, because I like things pretty subtle. I’m usually not a fan of any synthetic scents (not essential oils or such), but I actually really love this. You only need to burn it for 20 min. or so to REALLY get rid of even the most pernicious odors! My only other question at this point is whether you know of any sources of quality beef bones for a better price than what I’m currently finding, $4.99/lb? I’ve seen people mention 1.09… even free! If you can get in on buying a “side of cow” from your local farmer that is the best bet for great price or even free bones. You can purchase a quarter, half, or whole cow and they process the meat for you how you like and then you get the bones along with the price. The meat ends up being cheaper that way too. i made short ribs tonight in slow cooker. Can I use those bones to make the beef broth? Just wanted to make sure I can use already cooked beef bones, that I did not roast. Also, are the veggies necessary? Hi Paige! Yep that should work! If you don’t have the veggies on hand don’t worry about it. I have done broth plenty of times without the veg. Especially if you will be seasoning the broth in a soup or something you should be fine. Hope that helps! That sounds great Kim! Occasionally I will water down the broth to add to soup if I am running low – most of the time I use it straight up. Do what you can and what works for you! If you need to make the broth stretch a bit more you can water them down. Hi! We recently purchased 1/4 of beef (grass fed!). We received soup bones and dog bones. 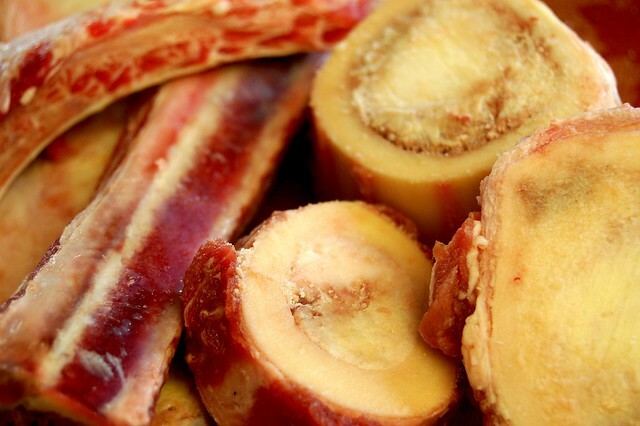 Can the dog bones be used for bone broth? Do certain bones work better then others? Any advice I would appreciate! Also thank you for the wonderful website and all the information! Hi Jennifer! I am not positive on the dog bones? I am assuming they are like rawhide type? I would do just the soup bones. The knuckle bones produce the most gelatin but anything beef bone I would take and use! I hope that helps! hello! I had a question, I’m doing your recipe for the first time. I’d like to know if the bones need to be dissolved in order for the broth to be considered as ready ? Hi Silvia! Great question! No they don’t – and per WAPF they really don’t need to cook longer than 24 hours to have the benefits. Beef bones are so large that I typically do 2 “rounds of broth” and still get a great gel. So I do two 24 hour rounds straining the broth after the first 24 hours and adding more water for a second “round” of 24 hours – does that make sense? with the regular oven? Thanks. Have you ever pressure canned your broth? Do you know if it affects the nutritional benefits of the broth? I have not Chloe – I’m not real sure how that works. 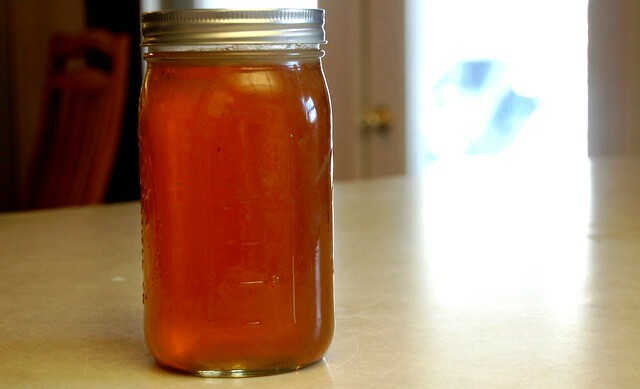 I do know if you google canning broth there is a certain method – it is not the same as doing produce. I hope that helps! i purchase free range organic turkey at thanksgiving. Can I make bone broth from that? Hi Alice! Yes we make turkey bone broth every Thanksgiving as well! It is delicious! Hi, I have read a bunch of your posts and you don’t mention being able to can the broths in glass jars. Is that a possibility as I don’t have much freezer room. Thanks. Can’t wait to try it! Forgive me, as I have never made bone broth. When you have roasted the beef bones and strained the liquid, the marrow doesn’t come out in the process? Is it acceptable to simply put the marrow into the broth? I have made beef broth & chicken broth (sorry….not your recipe!). However I didn’t roast mine. I don’t recall the recipe saying to. Any who, I was curious as to why the veggies used in the making of bone broth can’t be used in the finished product? I puree’d mine and added them to the broth. I used the last jar a few days ago in Beef Stew. Made for a thicker stew & was scrumptious. Usually I have enough left over for another meal for hubby & myself, not this time! I’ve ran across lots of various recipes for bone broth and none of them mentioned pureeing the veggies. Is there a reason why this isn’t done? Hi Anna! My kids eat them right out of the pot 🙂 Yes adding them into a soup or stew is just fine! I rarely toss them out! I purchased 16 pounds of grass-fed bones (8 lbs “marrow bones, 8 lbs “soup bones”). I plan to use my 22 quart Roaster. Is this about the right amount? When you first used bone broth for personal healing, what regimen did you follow? How much and how often did you drink it? Thank you! I made bone broth in my roaster oven 10 pounds- I used beef shanks, soup bones, ox tail, short ribs, and pigs feet. I cooked it for 36 hours . Made the house smell wonderful, tasted awesome and it jelled up beautifully. I froze half and I canned the other half.. It didn’t jelled back up after canning. Did I do something wrong? Does it have the same bennifets as the frozen half.. I am following the recipe closely but my broth is not geling. What should I be doing? Hi Pauline! That could be a couple things. First of all know that your bone broth is still very nourishing even if it doesn’t gel when it cools – if you used the ACV soak at the beginning it pulled out all of the minerals from the bones and there is still gelatin in there. A couple things could be the case – either there was too much water to bones ratio, or the bones you are using aren’t the real collagen rich bones. There are some bones like knuckles, marrow bones, and chicken feet that are super super rich in collagen – and other bones that are still great bones but aren’t as collagen rich. I don’t always get a perfect gel on my bone broth either – sometimes because I water it down a bit since I have a big family to feet – it stretches it. And sometimes because the bones I have aren’t very collagen rich. There is still gelatin in the broth and all the minerals and nutrients pulled from the bones. I hope that helps! Do you roast the bones with the meat still on? If so, what do you do with that meat then? Is it tender enough to eat? Thanks so much! Hi Betsy! Yes – sometimes you get a package of “soup bones” that have some meat left on them. You can roast and then use the meat for soup, stew, stir fry, or wraps! Okay, thanks so much! I appreciate your help. Hi. I used your recipe to make beef broth and it tastes good. However, I don’t know what people are talking about whend they mention the gel. Mine was just liquid. I strained it and froze part and put remainder in refrigerator. I wonder if it turned out the way it was supposed to……..
Hi Jean! It will be liquid when hot, and will gel up when cold. Sometimes if the type of bones used aren’t real gelatinous to the ratio of water, the broth will not gel – I get this sometimes as well. Adding chicken feet or real gelatinous beef bones like knuckles and marrow bones will provide more gelatin. If you followed the directions soaking with the acid in the beginning you are sure to have a nutrient rich broth either way! Hi! I just wanted to clarify when you say you do 2 “rounds.” So you roast, make broth, then roast again and repeat the process? Thanks! Hi Meghan! Nope! I roast, make broth, strain the broth out, throw the bones back in the pot, fill it with more water and veg and do another round! No need to roast twice! I’m using my 22 quart Oven Roaster to make bone broth. I love the quantity it makes. But, I struggle with straining the large quantity of liquid from the ingredients. What is the easiest and fastest way to strain the broth? Details reguarding equipement and proceedure are greatly appreciated as I’m a beginner. Hello – potentially silly question… I have beef bones, pork knuckles and pork trotters (feet) that I’m going to use together. Do I roast the feet and knuckles with the bones? Thanks for informative post and comments! Hi Kim! No silly questions here at all 🙂 Yes, I would roast them for best flavor in the final product of broth. I’m so confused. I’m making bone broth cooking 24 hours in a crockpot. I want to use it as beef broth in a beef cube and vegetable soup recipe. Will it taste right? Will it make the soup thick once it’s put in fridge? Should I mix bone broth with boxed beef broth in equal portions for broth required in recipe? Love your help and comments everybody! Hi Kristi! The broth will be liquid when heated – not in gelatin form. The soup will be thickened when cold in the fridge, but will melt into liquid when heated. Renee- can beef bone broth be used in vegetable and beef cube soup recipe for the requested beef broth ingredient?or, will it be to thick? I think that should work fine Kristi! Thanks so much for all your good recipes. 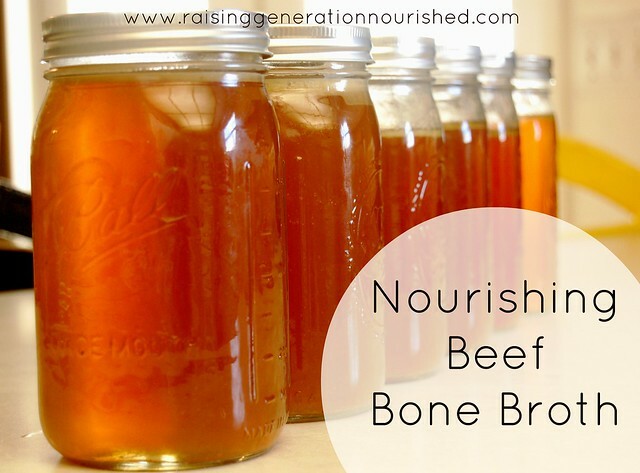 Here’s a note to ‘beef’ up the interest in the nutrient content of bone broth. I have osteporosis and this year have broken my foot, and both arms, at separate times, and my wrist, basically spent the entire year in some kind of cast…anyway, my nutritionist gave me the information that any kind of bone broth is essential in building up bones. So I have been making some kind of bone broth for the last 6-7 months but never thought of roasting them. The roasting is key…the last batch I made following your recipe is far superior to my usual recipe. So thank you so much! Hi Sarah! 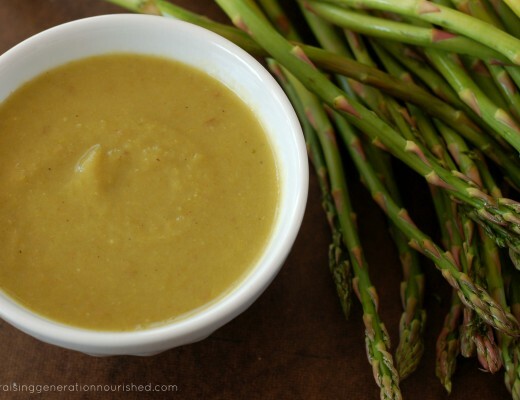 I’m so glad you enjoyed the broth with roasted bones – it really does make a difference!